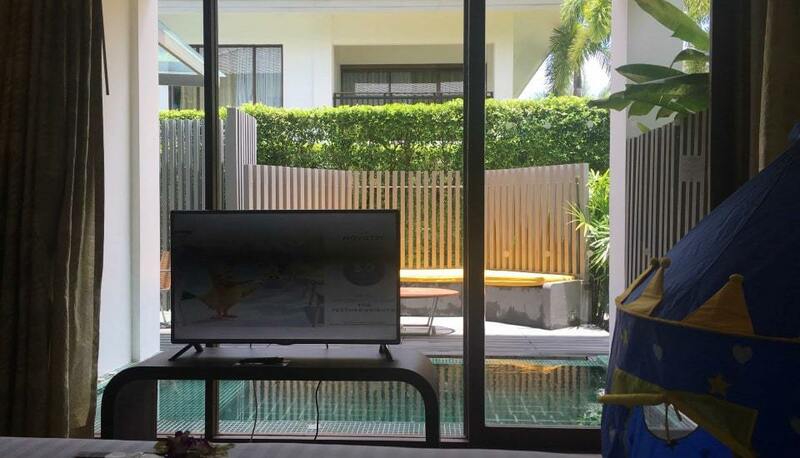 Summary: Friendly staff, homely yet modern rooms and exceptional family friendly facilities. 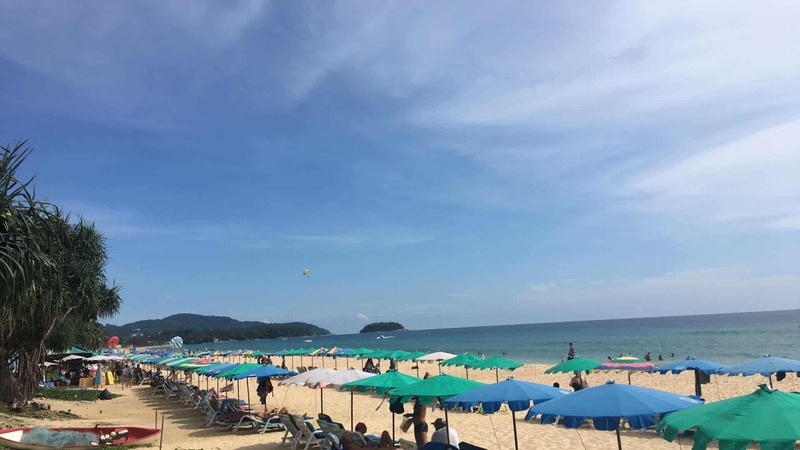 We recently returned to Phuket island on the west coast of Thailand to explore more of this popular holiday destination. We’ve been to Thailand many times but only once before to Phuket back in 2009. So we were keen to stay somewhere different and experience something new. 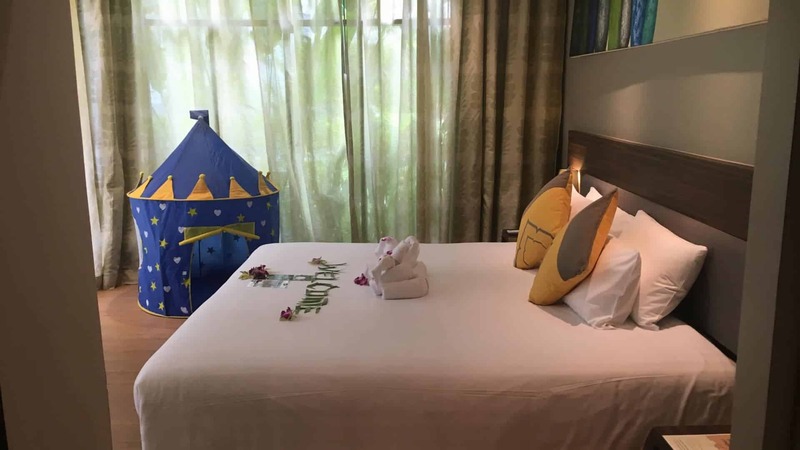 With an invite to check out two of the numerous Novotel hotels and resorts on the island we ventured south to Karon beach to review the Novotel Phuket Karon Beach Resort And Spa. Here’s our experience. After a pleasant drive along the coast we reached the small circular driveway of the Novotel Phuket Karon Beach Resort And Spa and were greeted by the very friendly staff. Thailand is known for its friendly locals and good resort service so there were no tricks missed here. A quick golf cart ride along the carefully manicured path lead us to our wonderfully secluded “plunge pool suite“. 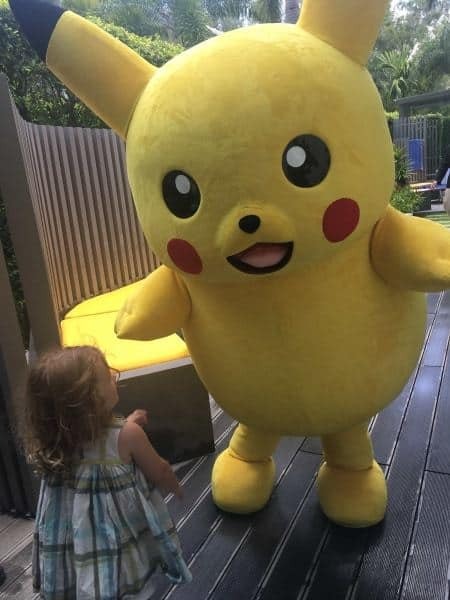 Our 2 year old daughter nearly lost her mind when who should greet her but none other than a 6 feet tall Pikachu! Thankfully she wasn’t scared and was soon hugging and high-fiving. The child-friendly welcome didn’t stop there as inside our suite was a plethora of welcomes suited perfectly to a 2 year old. She had her own bed with princess duvet and pillow along with a gaggle of cuddly toys for her to cuddle the stuffing out of. Not only that but a play tent in the master bedroom and a fun little treasure hunt for tasty chocolates (hidden in the wardrobe!). 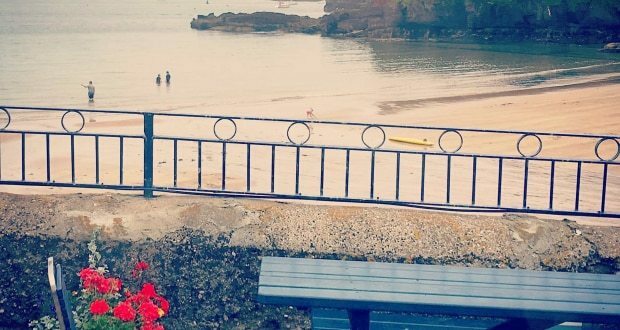 Its safe to say our little daughter felt right at home instantly and I’m sure all parents will agree that this means everything when you’re on holiday! The family friendly box most definitely ticked! Our plunge pool suite was an impressive space with a modern but earthy feel. As the name suggests it had a private plunge pool that we could step right into from the master bedroom and take a refreshing dip complete with jet bubbles. There was ample seating outside and the perfectly presented hedging landscaping did a wonderful job of making this fairly tightly packed complex of suites feel quiet and away from the hustle and bustle of Karon and indeed other parts of the resort. Inside the suite we had plenty of space for our suitcases and clothes, two large flat screen TVs (that was permanently on the cartoon network demanded by our daughter). The bathroom had access from both the lounge and master bedroom, annoying if you forget to lock both doors but beautifully presented with some very well thought out colour schemes and the very welcome addition of a bath! Perfect for our little toddler who for some reason despises showers. 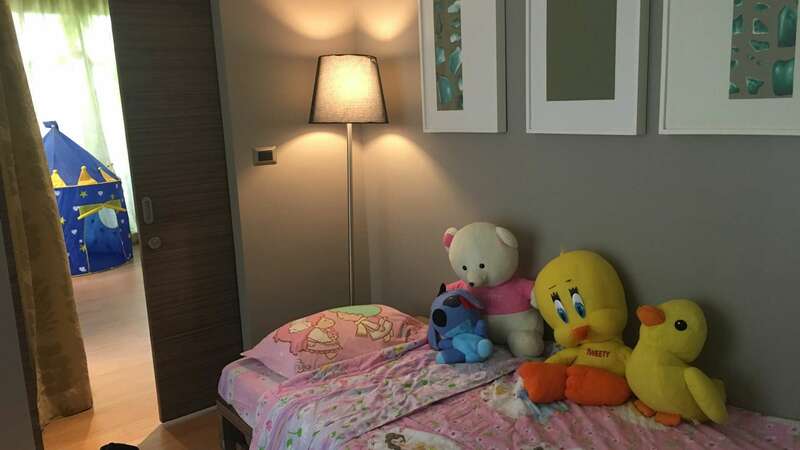 The master bed was huge and comfortable and the suite had the perfect balance of modern conveniences like smart lighting controls and universal power sockets as well as a natural homely feel. 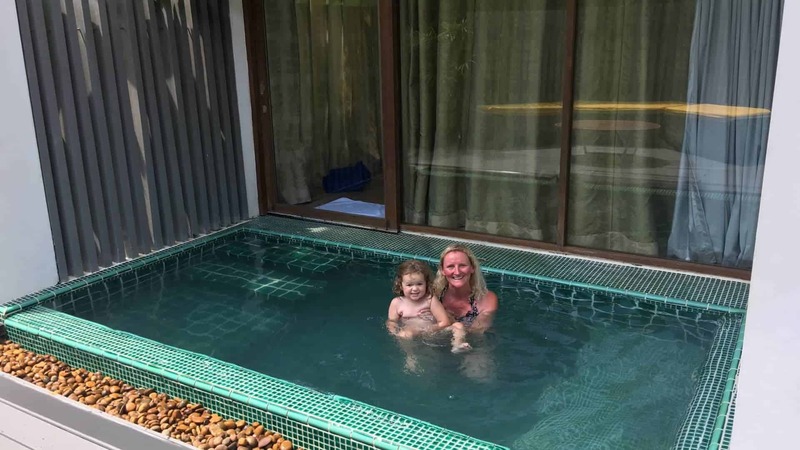 While our plunge pool was an instant hit especially with our daughter, there’s plenty more to see and do on-site. The main pool was always a popular hangout with a lively bar called Joe Kool’s Poolside Grill. The pool was an interesting shape with a bridge in the middle for easy access to your grilled lunch. There’s also the Horizon restaurant upstairs where the impressive breakfast buffet was served and often had live music and other entertainment in the evenings. There are two other pools on site offering a more exclusive feel. One has “Champions” Novotel’s signature sports bar showing plenty of sport all day long on multiple screens and offering the usual burger-and-fries style menu. As any parent will tell you we are at the whim of our children’s demands and on discovering the kids pool and play-centre she was hooked! A smaller pool with a fun little water slide kept her amused for a while but her favourite place to visit was without doubt the kids centre. 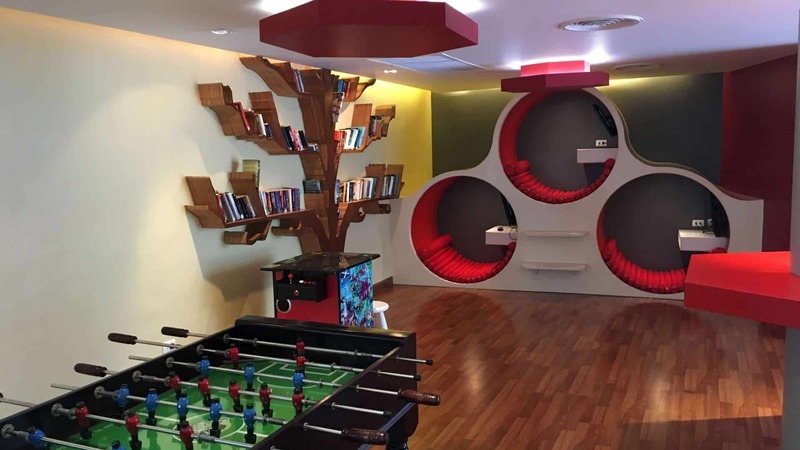 An indoor play area with all manner of activities, chill out areas, play-stations, books, movies, toys and anything else a child could ever want. Our daughter, rather than getting hooked on one thing, tried everything for about 60 seconds each, So I can safely say I’ve seen a lot of what this place has to offer. The staff here were wonderfully attentive and eternally patient as kids of all ages, moods and attitudes pass their doors. It was a welcome escape from the humidity outside too. 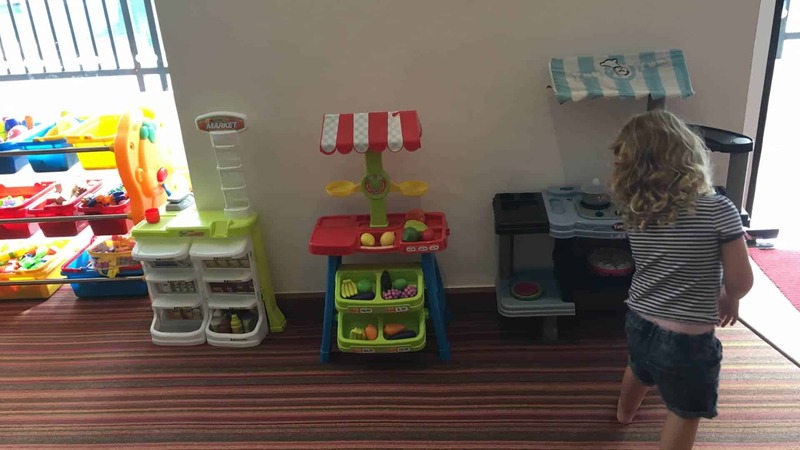 Our daughter enjoyed painting figurines, colouring and drawing, playing chef with the toy kitchen and making new friends every day. Its also a place to meet mums and dads and compare a few travelling-with-a-kid notes. I very much liked the fact that there was always someone sat at reception by the door making sure parents signed their children in and out. Also on site, through a labyrinth of walkways and corridors you’ll find the spa with a range of great treatments to choose from. I’ve been lugging suitcases, buggies and a toddler around Asia for 2 months now so a good back and shoulder massage was definitely needed. The staff were friendly, always smiling and with a calm air of serenity that every spa should have. The treatment room was dimly lit, sweetly aromatic and with the standard etherial background music. My 60 minute massage was firm and certainly showed my back muscles who’s boss. 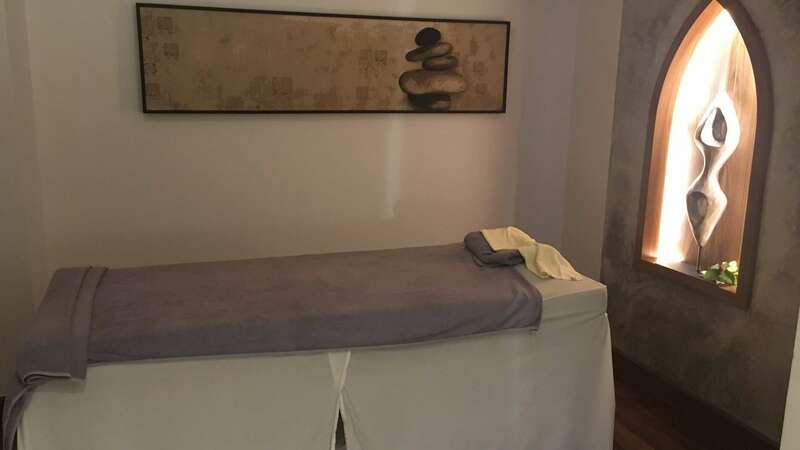 My only gripe with the spa experience was the door of my treatment room didn’t seal out the sounds from outside so the occasional guest or staff member walking the corridor could be heard, the odd banging door, etc. Not that big a deal but when they try so hard to create the perfect calming environment these sounds seem somewhat magnified. Other than its well worth getting at least one massage during your stay just to pamper yourself. 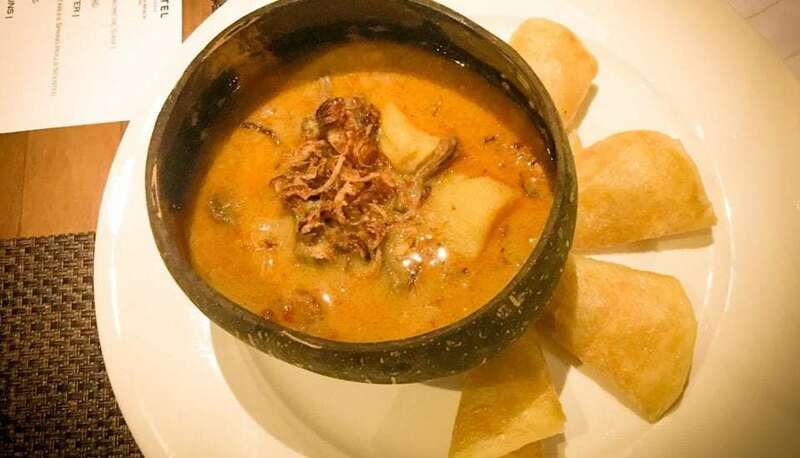 One of the biggest reasons for any trip to South East Asia is without doubt the food. Novotel’s Asian cuisine restaurant Tai offered us a set menu to experience some of their finest dishes. 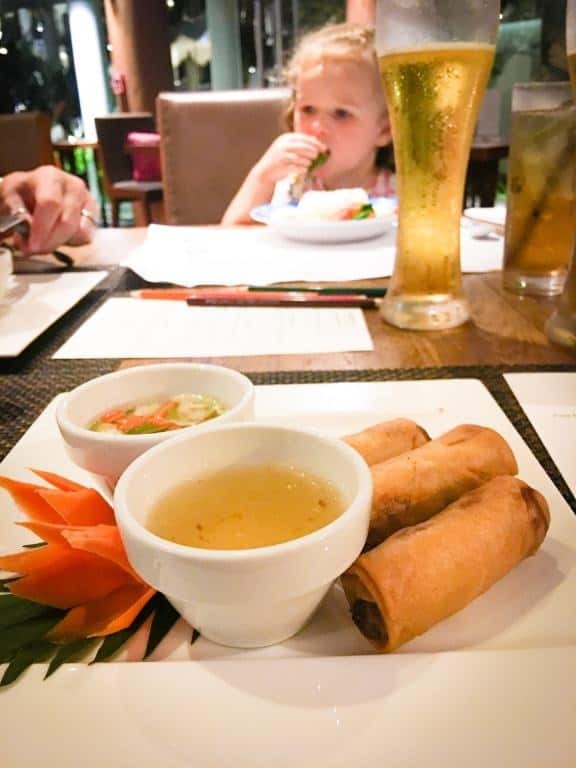 Tom Yam flavoured vegetable spring rolls to start followed by Japanese Tempura King Mushrooms, Wagyu Beef Massaman Curry and Steamed whole Sea Bass served with Chilli and Garlic Sauce. The curry was without doubt my favourite, beef that just dissolved as you chewed with sweet and spicy Massaman flavours that I will try my hardest to replicate when I return to England (and almost certainly fail!). All of this delicious food was rounded off nicely with a seriously chocolatey mini cake with hot melted gooey centre. Divine! 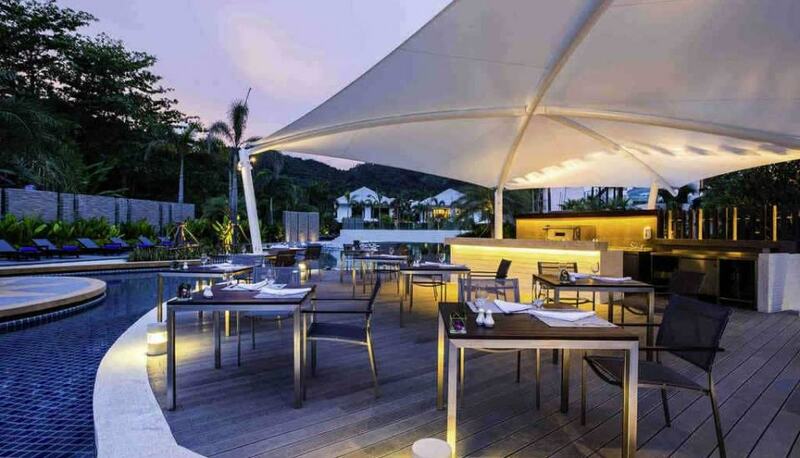 The atmosphere in Tai is quiet and somewhat reserved compared to the more informal and western dining options at the Novotel Phuket Karon Beach Resort And Spa. A welcome change and very tasty meal I can highly recommend. Karon beach is all of a 3 minute walk away. Don’t follow the road around the coast, instead hop across the busy road (a member of staff will stop traffic for you!) and take the bridge to the other side where you’ll easily see the short-cut straight to the beach. There’s a number of small restaurants here all vying for your attention as you walk past, definitely worth stopping for lunch or a beer. Walking in to town is very easy and you’ll soon be surrounded by shops, cafes, restaurants and more hotels. Phuket isn’t the cheap island it once was so expect to pay similar prices in town as hotels charge. There’s plenty to choose from here and lots of daytime activities too other than tanning yourself on the long stretch of beach, from Elephant treks to cooking classes. You can book many of these from tour operators in town or just ask at reception of the Novotel and they’ll help arrange your activities too. If there’s one thing is very easy to do in Thailand its get around! Thailand has all manner of interesting transportation options. 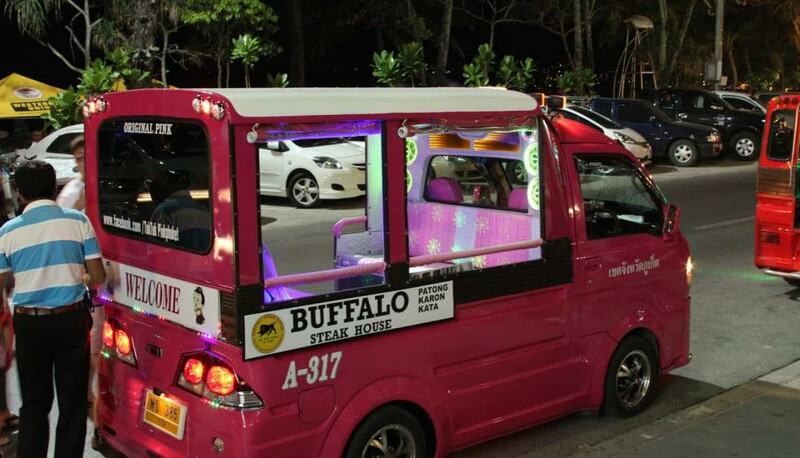 You wont fail to spot plenty of tuk-tuks zipping about, you’ll more likely hear one coming before you see it. These aren’t the 3 wheeled tuk-tuks you’ll see in other parts of Thailand as 4 wheels are definitely needed in this hilly environment. Many of them are no adorned with powerful sound systems blasting dance music from there flashing LED covered speakers. If you’re looking for a night out the party will definitely start the moment you jump in to the back of one of these. Other options include taxis and hotel transfer vehicles to and from the airport but your best bet for a good deal now is Uber or the more popular Asian version called “Grab”. Just download the Grab app, sign up and book a local driver for much less than the cost of a normal taxi. Prices are still high compared to other areas of Thailand and Asia but Grab taxis are still one of your cheapest options. 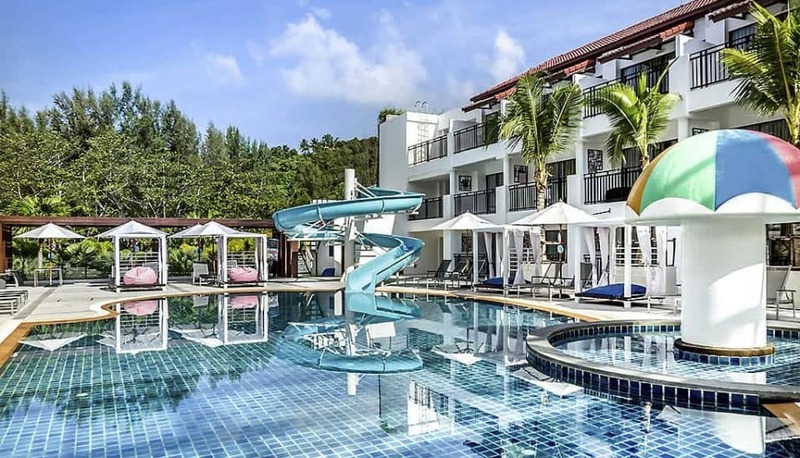 The Novotel Phuket Karon Beach Resort And Spa was a refreshing resort in a refreshing location we hadn’t explored before. Karon is definitely a welcome break from the madness of some areas of Phuket like the ever popular Patong. 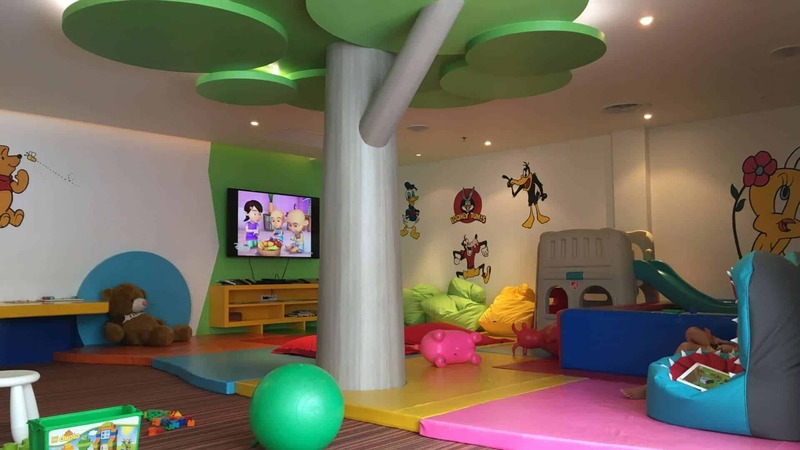 The resort caters brilliantly for children which quite frankly transformed our stay as our daughter was in heaven the whole time. The landscaping of the entire site created a very impressive secluded feel throughout, the plunge pool suite was perfect for the 3 of us, I now wish I had a plunge pool at home! 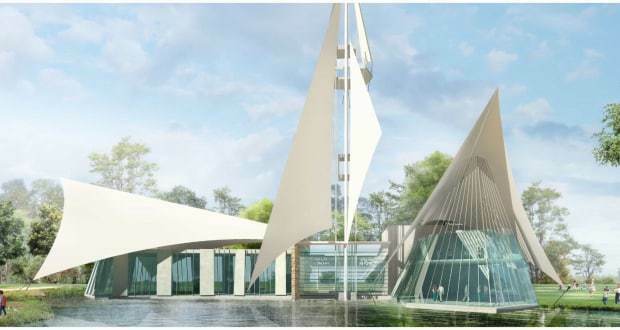 Its also worth checking out their Phuket hotel promotion for the latest special offers. This review was sponsored by Novotel resorts and hotels. All opinions are my own.